The phrases "Native Canadians" or "Aboriginals" describe the descendants of the people who were living in what is modern-day Canada before European colonists, explorers, and traders arrived in the 1600s. Giving labels to these groups is complicated by emotional and historical issues. Aboriginals inhabited all regions of Canada and the United States, and dozens of tribal groups, lived, hunted, fished, and foraged (gathered native plants) all across North America. 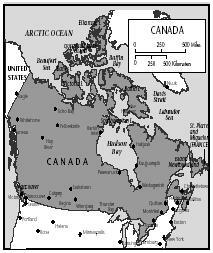 The provinces of modern-day Canada obviously did not exist when the Europeans arrived on the east coast of Canada. The Inuit inhabit the northernmost parts of Canada. On April 1, 1999, Nunavut (pronounced NOON-ah-voot) became Canada's newest territory, created from about half the land that made up the Northwest Territories. In general, most Canadians agree that the approximately 800,000 Aboriginal Canadians counted by the 1996 Census of Population may be identified as belonging to one of three groups: First Nations (554,000), Métis (210,000), and Inuit (Innu, 40,000). The First Nations people are members of the approximately 50 recognized "First Nations" or tribal groups in Canada, and they inhabit all parts of Canada. The Métis are descendants of the intermarriages that occurred between the men employed by the early European fur trading companies (Hudson's Bay Company and Northwest Fur Company) and Native Canadian women. harsh climate of their northern homelands, the Inuit diet included very few fresh vegetables or fruits. In the short summers, they would gather berries, both for eating fresh and for drying to eat during the long, cold winter. They would also gather seeds and nuts to store to supplement the winter diet. Grains such as corn, wheat, and wild rice were harvested and dried. Grains would sometimes be ground to produce flour, or mixed with water and cooked. Pemmican is a nutritious, high calorie food that can be prepared in quantities and stored. The French and English explorers, trappers, and traders, bought large quantities of pemmican from the Aboriginals, and even learned to make pemmican. Pemmican would be sealed inside an animal skin or stomach cavity to preserve it. Europeans carried these pemmican stores on long furtrading expeditions. Line muffin cups with paper liners (or grease cups well). Grind or chop beef jerky into confettisize pieces to make about 1 cup. Melt suet or shortening in a saucepan. Remove from heat, stir in beef jerky, dried berries, and seeds. Stir in honey. Spoon about ¼ cup of the pemmican mixture into each muffin cup. Press down firmly to make a cake, smoothing the top. The traditional diet of Aboriginal people was made up of the animals and plants found on the land and in the sea around them. 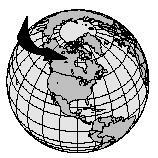 Seal, whale, buffalo, caribou, walrus, polar bear, arctic hare (rabbit), all kinds of fish and many species of bird were hunted or fished. Raw blubber (fat) was enjoyed or mixed with meat or berries. Every part of the animal was consumed or used to make clothing or shelter. Because the foods were eaten raw or with minimal processing, the Aboriginal people were generally well nourished. Modern-day First Nations, Métis, and Inuit people have added processed foods and convenience foods to their traditional diet, and are experiencing the health problems that come from consumption of foods rich in sugar and additives (such as tooth decay and obesity). Their traditional diet was nutritious and high in calories, but the calories were needed to help keep their bodies warm through the long, frigid winters. During the short summers, Aboriginals (mainly the women) would plant small gardens and gather wild berries and seeds. Corn, beans, and squash were common vegetables grown in the small gardens of Manitoba and Alberta. These vegetables were often simmered to make soups or stews, such as Three Sister Soup (the "sisters" are corn, beans, and squash). Snacks were often enjoyed right on the trail—a few berries or dried seeds plucked from the wild plants. Some were eaten right on the spot, and some may have been carried home to share or save for another day. Saskatoon berries, similar to blueberries, have been picked and eaten in the wild by Aboriginal Canadians for centuries. In the late twentieth century, commercial fruit growers began planting crops of these tasty berries to sell to grocery stores. If using fresh berries, rinse them under running water. Divide berries into several waxed paper bags or plastic baggies. Carry these along for snacks during the day or to share with a friend. Pour the chicken broth into a large saucepan or kettle. Heat until the broth begins to boil. Add the corn, beans, squash, and bay leaves. Lower heat and simmer for 45 minutes. Add optional spices if desired, and simmer 15 more minutes. Remove the bay leaves, and transfer the soup in batches to the blender to puree if desired. Serve with bannock (bread). Aboriginal peoples who lived on the prairies of western Canada consumed buffalo (and used buffalo skins for clothing and shelter). In central Canada, Ojibwa people would gather wild rice from the waters of Ontario and Manitoba, allowing it to dry and then roasting it. The fur traders, who came into contact with Aboriginal peoples all across Canada, introduced a bread similar to the Scottish scone. It became known as bannock . Bannock may be baked (Aboriginal people would lay it on hot rocks near a campfire) or twisted onto a stick and cooked over hot coals. Bannock may be baked in the oven or over a charcoal or open fire (recipe for Bannock on a Stick follows). Combine flour, baking powder, sugar, and salt in a large mixing bowl. Measure the milk (or water) and add it to the flour mixture, stirring with a fork to combine. A dough should form. If the mixture seems too dry and crumbly, add more liquid, one Tablespoon at a time. Pat the dough into a circle about ¾-inch thick. Transfer the dough to a well-greased cookie sheet. Prick the surface of the dough all over with a fork. Bake about 20 to 30 minutes, or until golden brown. Prepare Bannock dough (see preceding recipe). Have ready several sticks, 3- to 4-feet in length. Divide the dough into balls slightly larger than golf balls. Shape each ball into a rope about 8 inches long by rolling it between the hands. Wrap each dough rope around a stick. Hole the dough over a a bed of red hot coals (charcoal, wood, or gas grill flame set at medium.) Turn the stick frequently to bake the dough evenly. Wild rice, called Man-O-Min by the Ojibwa of central Canada, quadruples in size when cooked. Wash the wild rice in a colander or bowl, changing the water two or three times. Measure water into a large saucepan; add salt. Heat the water to boiling. The rice grains will swell to four times their original size. Aboriginal peoples living in the region of modern-day British Columbia enjoyed foods such as salmon cooked over an open fire, a popular modern-day delicacy. The traditional feasts held by Aboriginal peoples usually revolved around a harvest, or seasonal excess of food. For example, if there was a large salmon catch, a feast would be held. When a youth killed his first seal or caribou, a celebration feast might be held. In western Canada, Aboriginal peoples held ceremonial parties called potlatches to celebrate the birth of a child, a young woman reaching puberty, or the marriage of a son. Modern-day potlatches are held to celebrate and preserve Aboriginal culture. In 1996 an annual National Aboriginal Day was proclaimed, to be celebrated on June 21 each year. There is no specific menu associated with the celebration of this holiday, but many traditional foods, such as salmon, wild rice, and even buffalo, are enjoyed during the festivities staged by many of the Aboriginal groups. Rinse the wild rice in a sieve under cold running water and drain. Measure the 4 cups of water into a saucepan and add rice and the salt. Heat until the water boils, reduce heat, and simmer for about 30 minutes. The rice should be tender but not soft. Add the cornmeal slowly, stirring constantly with a wooden spoon and cook for 3 or 4 minutes. Remove from the heat. Melt bacon drippings (or butter) in a skillet. Shape the rice mixture into pattie-like cakes about 1½ inches in diameter. Sauté the patties until they are brown on one side (about 5 minutes). Carefully turn the cakes over to brown the other side. Drain on paper towels. Serves 12; may be served hot or at room temperature. Aboriginal peoples are hospitable, and always have stews or teas simmering and available to serve to guests. Historically, cooking utensils were fashioned from natural materials and cooking was done over an open fire. Food preservation methods included smoking, drying, and encasing in melted animal fat or whale blubber. The substitution of packaged and fast foods for the nutrient-rich traditional Aboriginal diet has contributed to health problems among Aboriginal children. The Canadian Government's Minister of Indian Affairs and Northern Development continues to work to address the concerns of the Aboriginal peoples. Addressing historic wrongs and developing modern-day programs is challenging, and representatives of the government and the First Nations, Métis, and Inuit peoples are striving to communicate and design goals to meet the needs of all Canadians. Alexander, Bryan and Cherry Alexander. What Do We Know About the Inuit. New York: Peter Bedrick Books, 1995. Harper, Judith E. Inuit. Mankato, MN: Smart Apple Media, 1999. Jackson, John C. Children of the Fur Trade: Forgotten Métis of the Pacific Northwest. Missoula, MT: Mountain Press, 1996. Lutz, Norma Jean. Nunavut. Philadelphia: Chelsea House, 2000. Morrison, David A. Arctic Hunters: The Inuit and Diamond Jenness. Hull, Quebec: Canadian Museum of Civilization, 1992. Santella, Andrew. The Inuit. New York: Children's Press, 2001. Aboriginal Awareness Week. [Online] Available http://www.aboriginalawarenessweek.gc.ca/ (accessed August 17, 2001). Liboiron, Henri and Bob St-Cyr. "Making Pemmican." [Online] Available http://collections.ic.gc.ca/notukeu/pemmican_e.htm (accessed April 17, 2001). Métis Nation. [Online] Available http://www.metisnation.ca (accessed August 17, 2001). Métis Nation Ontario. [Online] Available http://www.metisnation.org (accessed August 17, 2001). National Aboriginal Day. [Online] Available http://www.ainc-inac.gc.ca/nad (accessed August 17, 2001).